I just realised none of my hammers is heavy enough to leave a mark when I am counterpunching. Does anybody know the weight of the hammer I should buy? Looking at Stan's one it looks like something between 1,5 and 3 kilos. By chance yesterday I checked the weight of the hammer in use in the photograph above (I'm working on a set of photographs of striking fixtures now). It is 48 ounces, which is 3 pounds, or roughly 1.5 kilograms. Moxon and Fournier are vague about how many hammer blows it takes (Moxon only says "reiterated Blows"). Some sources imply that it doesn't take many - Koch's Dolphin article says "a few blows with the heavy hammer." But in Stan's experience it takes many blows. For driving into a copper matrix he says 20 to 30 (and in one case while he was driving a punch in the 16-point range into copper I counted - 23 blows with the hammer shown above). Stan does these in groups of five blows, stopping to check between groups. Counterpunching took at least as many - the counterpunch is smaller, but you're driving into steel. Counterpunching and punching have one other interesting difference. In punching the matrix, you are ultimately concerned with the bottom of the punched hole (which becomes the printing face of the type). But in counterpunching, you're concerned with the TOP of the punched hole, which becomes the outline of the counter on the surface of your punch. So a smoke proof of a counterpunch is misleading. Instead, you can prove a counterpunch by test-driving it into a bar of lead (lead works better than typemetal for this because it is softer and less brittle). It would be interesting to try a heavier hammer - though much bigger than this and you're getting into a small sledgehammer. Stan suggested avoiding a carpenter's claw hammer. You're going to have your face closer to the work than a carpenter does, and you don't want to whack yourself in the face with the claw. Also, as an important safety measure: Stan always wore safety googles when striking either counterpunches or punches. I presume that good *side-shield* safety glasses would work too. This is important. You're hitting hardened steel (and, moreover, steel hardened and tempered by an amateur in only semi-controlled conditions). It can shatter. In fact, a couple of punches in the class DID shatter. The sharp pieces of shrapnel that result can go anywhere, including into your eye. You don't want to be so authentic in your typographical work that you re-create 17th century industrial injuries. So do wear safety goggles or good side-shield safety glasses. In his youtube video, Stan seems to strikes only one time with his hammer, but maybe it was edited that way. OK, I will try with a small moker of 3 kilos. You could try a Japanese blacksmith hammer, which is designed to maximise force in a small area. European and North America hammers tend to gain surface area as they gain mass, but Japanese hammers add weight mostly in the length, concentrating it behind the small striking area. This might be ideal for striking punches. Actually, Koch is more specific in his 'Dolphin' article: "...then I drive it in with two or three blows of my heavy hammer that may weight up to one kilo". Also depends on how you hold the hammer. If you hold it up at the head like in the picture of Stan above, then you've only got head's weight and your arm strength providing force for the blow. If you hold the end of the hammer, you also get a lot of leverage and thus much more force, but much less control. In The Art of Punchcutting by Christian Paput he says that there is a different weight hammer for each point size, but unfortunately does not specify them. Well, it's strange because Paput is known for the use of the digging technique, so no counterpunches involved. And AFAIK, this is not the title of the book Paput wrote. Moreover, using a different hammer for each point size make no sense. 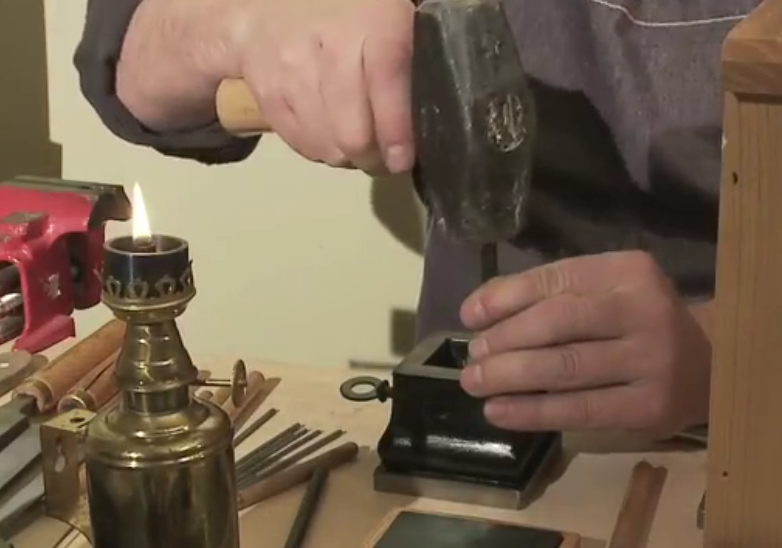 You can cover a wide range of bodies with only a 1-1,5 kilos hammer, although a much lighter hammer is good for testing counterpunches on lead (I use a very light engravers' hammer for this). much more force, but much less control. Sometimes a heavier hammer can give you more control because you need less 'windup'.